Those that fall (lol) for the charm of Kennebunkport’s coastal charm in quieter times, take advantage of the affordable rates at luxury hotels, inns and BnBs, and great dining deals, happy hours, and more. Many Kennebunkport restaurants remain open year round, no lines or waiting, walk in and enjoy with the locals. Here, a list of personal favorite restaurants in Kennebunkport. 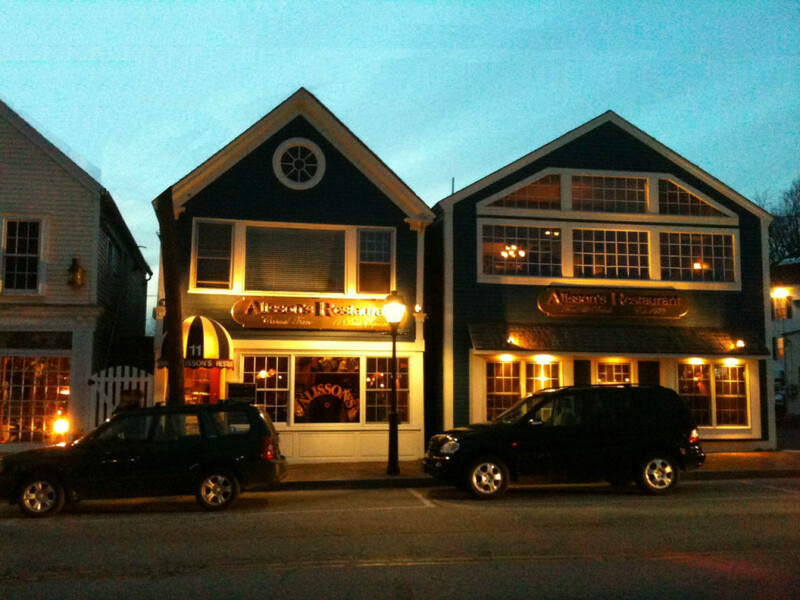 Alisson’s Restaurant is Kennebunkport’s local treasure situated at the heart of Dock Square. This place makes you feel at home with its pub style atmosphere and big screen TVs attracting many sports fans to the bar for games and creative drink specials. Whether you’re simply joining in for Alisson’s entertainment or Pub Trivia Night, you must try the clam chowder and lobster rolls–simply out of this world. Alisson’s will certainly make a regular out of you. The Boathouse Bar at the Boathouse Waterfront Hotel has a lovely bar and restaurant overlooking the River. Happy Hours here are great, so is the view from the deck. Stripers Waterside Restaurant at The Breakwater Inn has a riverfront setting with sea views out towards the breakwater. While sunsets here are a highlight, the atmosphere and cuisine are great too. With a Lobster Lovers menu, and seafood specials daily, plus Sunday brunch and happy hour in the bar or outside in adirondack chairs by the river – Stripers is a top pick! The Burleigh at Kennebunkport Inn is a classic pub with great fare from Brussel sprouts to Maine mussels, Lobster rolls or lobster pasta, burgers, and steaks. With frequent live local dish entertainment in the cozy pub, its a favorite locals spot. Daiy happy hour is 3-5 at Burleigh. Old Vines Wine Bar is a classic wine bistro and pub in Lower Village Kennebunk. A cozy interior and frieindly barkeeps make this a great go-to for drinks, countless wine selections and craft cocktails, and tapas style fare. Old Vines Wine Bar often has live enetertainment in their upstairs venue – yes there’s a bar there too. Ports of Italy brings classic Italian to Maine, with delicious pasta dishes, and wood-fired pizza. If you’re looking for a restaurant with a relaxed and romantic ambiance, you’ve come to the right place. Located in Lower Village just before the bridge to Dock Square and the Clam Shack. Admiral’s Table is outdoor poolside dining at the Rhumb Line Resort fro lboster bakes or a cheeseburger and coold beer or cocktail. Mabel’s Lobster Claw on Ocean Ave just a mile from Dock Square serves classic Maine seafood, baked stuffed Lobster, fresh fish daily, fried clams, and decadent homemade desserts. 95 Ocean offers water view dining at the Nonantum Resort and often live entertainment with dinner and dancing. The menu offers fresh fish, lobster, creative Maine dishes, and BBQ. Heckman’s Pub off the Hotel lobby is more casual for a cocktail and pub fare. Earth at Hidden Pond is a cool, earthy setting with a creative open concept culinary scene. Oyster to octopus, lobster to wood-fired meats and fish, its trendy and a real treat. Well there you have it..Kennebunkport restaurant recommendations from a local Maine resident. I hope you enjoy these restaurants as me! Be sure to leave a comment and share your experience at one of our restaurants in Kennebunk.